Burns are categorised based on the depth of involvement- as first degree, second degree and third degree. Depth of burn is often related to its cause, for e.g. ; scalds from hot liquids are usually partial thickness, whereas injuries from contact with flames, hot metals, or electric current are usually full thickness in depth of the skin. Immediate: Cold compresses relievepain and reduce swelling. Topical: Bland emollients, topical antibiotics such are helpful. Dressing in second degree or severe burns by skin substitutes should be done. Burns if second or third degree (deeper in depth) in nature often leads to healing with scarring, hypertrophic scar or keloid and contracture formation. Apart from cosmetic concern, with person’s self-confidence being massively affected, it often leads to difficulty in mobilization and full range movement of affected parts in daily activities. Creams: Topical medications can be prescribed that help in flattening and repigmentation of scar. 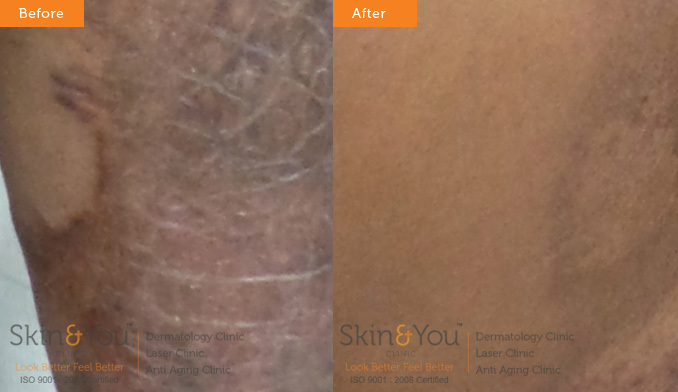 Laser treatment for scar: We at skin and you use laser to resurface the scars and release the contractures. The procedure helps in flattening and blending in of scars and over time a scar resurfacing of 90% is noticed by the procedure. MCA Treatment: a specialised treatment carried out for scar filling and rejuvenation at skin and you clinic. Why skin and you clinic for burns scar treatment? We at Skin & You Clinic, assess, counsel and manage these burn scars with topical and Radiofrequency based resurfacing procedures. These procedures have been helpful to release some tension over the contracture bands, with improvement in scarring and pigmentation. Overall, it helps in regaining individual’s self-confidence with mobility also being improved up to a large extent.